The world’s business media are paying rapt attention to Glencore’s now stalled attempt to take over Rio Tinto. Glencore announces that in July 2014 it made an informal enquiry by telephone call to Rio Tinto, seeking to gauge whether there might be any interest at Rio Tinto in investigating some form of merger between the two companies. Rio Tinto responded that it was not interested in pursuing these discussions. Glencore confirms that it is no longer actively considering any possible merger transaction with, or offer for the shares of, Rio Tinto. As a consequence of this announcement, the Panel Executive has determined that Glencore is for a period of 6 months from the date of this announcement subject to Rule 2.8 of the City Code on Takeovers and Mergers in relation to Rio Tinto. Glencore however reserves its rights to make an offer in the future with the consent of the Takeover Panel, either with the recommendation of the Board of Rio Tinto, in the event of a third party offer for Rio Tinto, or in the event of a material change in circumstances. The board of Rio Tinto notes the recent press speculation regarding a possible combination of Rio Tinto and Glencore. The Rio Tinto board confirms that no discussions are taking place with Glencore. In July 2014, Glencore contacted Rio Tinto regarding a potential merger of Rio Tinto and Glencore. The Rio Tinto board, after consultation with its financial and legal advisers, concluded unanimously that a combination was not in the best interests of Rio Tinto’s shareholders. The board’s rejection was communicated to Glencore in early August and there has been no further contact between the companies on this matter. According to Bloomberg, Glencore’s secretive CEO Ivan Glasenberg made a verbal stock offer to Rio Chairman Jan Du Plessis in July. The Rio Tinto board rejected the offer in August, which means under that UK law, Glencore must wait six months before making another bid. Glasenberg’s informal July bid carried no significant premium, said the person, who asked not to be identified as the information is private. Bloomberg goes on to report that. 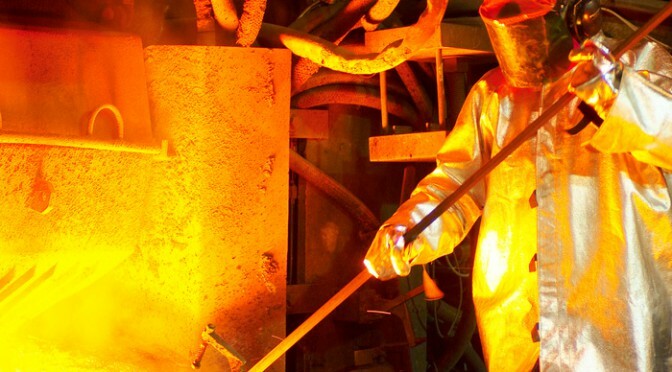 After being rebuffed by the board, Glencore has reached out to Rio’s biggest investor, Aluminum Corp. of China, to gauge its interest in a potential deal in the next year, according to people familiar with the matter. After the initial report on the takeover Monday, business writers used epic analogies. Forbes says of Glencore “Patient Stalking Of A Target Is A Glencore Hallmark” while the Globe and Mail reports Glencore “The great white shark of the global commodities industry” is looking for a blockbuster deal. Meanwhile, behind its premium paywall Lex, the Financial Times is comparing the Glencore bid for Rio Tinto to the Game of Thrones. The analysts are saying there are two main factors, Rio Tinto’s balance sheet has been weakened by a downturn in the iron ore market while at the same time Glencore aims to overtake Rio Tinto rival BHP Billiton. If it acquires RT, then Glencore will become the world’s largest mining and resource company. The business media all say Glencore is already the world’s biggest trader in commodities. The Guardian has called Glencore, the Biggest Company You Never Heard of. China is a major force behind this corporate Game of Thrones. China wants more access to world resources for its increasingly hungry industry and population,while at the same time it has apparently all the iron ore it needs and iron ore is Rio Tinto’s biggest asset. The key player is a giant Chinese aluminum company now under investigation as part of the country’s corruption crack down. Glencore along with Rusal has an undisclosed interest in Rusal’s Windalco alumina operation in Jamaica. Glencore also has an undisclosed interest in the Alumina Partners of Jamaica. It owns 44 per cent of Century Aluminum in Monterey California. Glencore has also undisclosed interests in idle aluminum smelters in Washington State and Montana. It has an undisclosed interest in Kubikenborg Aluminium AB in Sweden, Aughinish Alumina in Ireland and Eurallumina in Sardinia. In the northwest, Glencore, through its agricultural subsidiary Vittera, is a partner, along with Cargill Ltd. and Richardson International in the Prince Rupert Grain Terminal. In Vancouver, Glencore owns Vittera’s Cascadia grain terminal in Vancouver. Glencore is also developing a metallurgical coal mine near Chetwynd. Glencore, through the earlier 2013 take over the mining company Xstrata owns the famous Kidd copper and zinc mine near Timmins, Ontario. The operation has 1300 employees. (Xstrata earlier took over the well-known Canadian mining company Falconbridge). 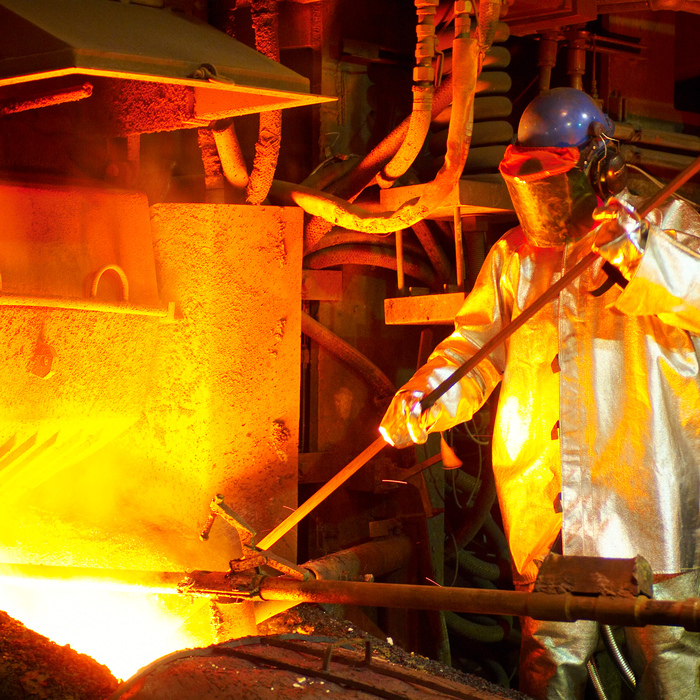 It also operates the Horne copper Smelter in Rouyn-Noranda, Québec, which employees 700 and the CCR copper Refinery in Montreal, Québec which employees 650. In Sudbury, Glencore is reviving the Errington-Vermillion Project, two deposits were that were previously mined in the 1920s and 1950s. 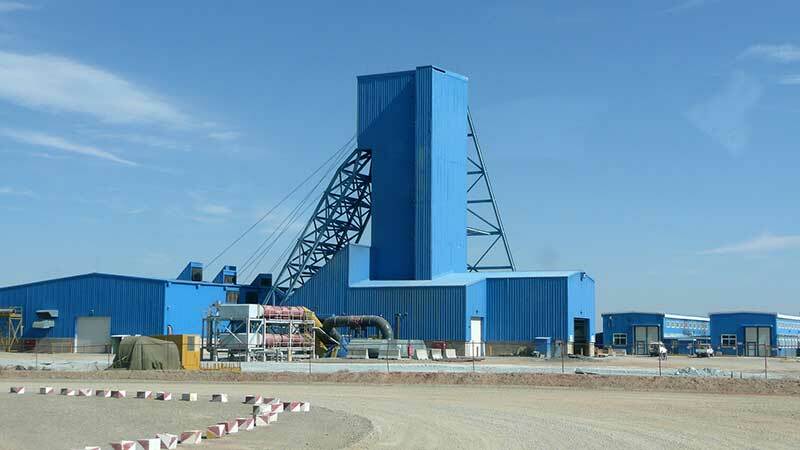 It says the project has potential for approximately nine million tonnes, polymetallic- zinc, lead,copper, silver, gold or a rate of 2,900 tonnes per day. The other factor for Kitimat with Glencore is that, unlike Rio Tinto, which is mostly a mining and smelting company, Glencore has interests in natural gas, oil and shipping and it is reported that the company wants to expand its hydrocarbon business from extraction to shipping. The chairman of Rio Tinto, Jan du Plessis said the board was happy with the leadership of managing director, Sam Walsh, and finance director, Chris Lynch. Interestingly, that might not be a view shared by all Rio Tinto shareholders who are still smarting from the $40 billion written off after the ill-timed acquisition of the Alcan aluminium business, followed by a $3 billion write-off after an equally poorly executed coal asset deal in Africa. Rio Tinto remains focused on the successful execution of its strategy, which the board of Rio Tinto is confident will continue to deliver significant and sustainable value for shareholders…. The board believes that the continued successful execution of Rio Tinto’s strategy will allow Rio Tinto to increase free cash flow significantly in the near term and materially increase returns to shareholders. Rio Tinto’s shareholders stand to benefit from the very considerable value that this will generate. The Guardian says, echoing Forbes’s talk of a patient stalking. It is an open secret that Mr. Glasenberg, a multibillionaire South African, has every intention of using mergers and takeovers to greatly extend Glencore’s reach along the commodities value chain. Glencore’s strategy is to control the mines, the warehouses, the ports, the ships and the trading networks that produce and distribute commodities. The question is whether Rio’s management and shareholders would endorse a deal that could come with no takeover premium. Some analysts think not. Aluminum Corp of China general manager Sun Zhaoxue is suspected of “serious violations” of the law, a euphemism for corruption, according to a notice published by China’s Central Commission for Discipline Inspection. Sun is also the vice chairman of Chinalco’s listed subsidiary, Aluminum Corp Of China Ltd. He is the former president of China National Gold Group Corp, the country’s biggest gold producer. Sun resigned the next day . Other company executives had resigned earlier. Some business analysts say even if Rio Tinto shareholders are not happy with current management they may not want their holdings affected by a possibly corrupt Chinese company. On the other hand, as the Telegraph points out, it is really the Chinese government that will make the decision, not the company itself. China’s government holds the key to a deal despite Rio Tinto’s public rejection of Glencore’s interest. State-owned Aluminum Corporation of China is the largest shareholder with around 10 per cent and Glencore reportedly started talking to the Chinese in the summer to sound out their interest in an exit. Although China is the world’s largest consumer of iron ore and owning such a significant stake in one of the world’s biggest mining groups is strategic now could be a good time to exit. The world is flooded with iron ore and securing supplies for steel mills is no longer an issue for the Chinese government. Now is a good time to cash in. The man behind the so-far failed deal, who is likely “patiently stalking” Rio Tinto is the highly secretive and private Ivan Glasenberg. It is a classic strategy in the shadowy world of mergers and acquisitions and Ivan Glasenberg, the chief executive of Glencore, is a master of this dark art. Glasenberg was born in South Africa in 1957, and apparently now holds four passports, South Africa, Australia, Israel and as of 2011, Switzerland. When Glencore went public on the London Exchange in 2011, which the Guardian called “the biggest stock exchange float in British history,” the British media received a letter from a London law firm warning the normally aggressive media not to probe into the private lives of the company executives. Glencore executives, the letter said, “are extremely private individuals”, who expected scrutiny of their business activities, but not their personal lives. A warning followed about the “security risk” that could be posed by any reports about their homes or private lives. It appears that for the British media the royal family and missing school girls are fair game but not Glencore’s executives. Should Glencore ever takeover Rio Tinto, the Wall Street Journal says Glasenberg told the paper Glasenberg: We Don’t Do Work-Life Balance may be a indication of the future, especially for management. Although he was referring mainly to the company’s main business, commodity trading, the interview is enlightening. This competitiveness, he says, is smart business. “If I’m not pulling my weight and setting an example” and “traveling 80% of the time”, his charges would complain to the board and try to get him fired…. Mr. Glasenberg, who had been CEO of Glencore since 2002, says he is insistent on instilling this culture at Xstrata, a mining company. Glencore had amassed a portfolio of mines over the past decade. “I thought if we could put our hard-working culture as traders into the asset management it will be a great combination and we did do that,” he says. But according to the Huffington Post, an employee who wants to be a traders is welcome to try. One area where Glasenberg does get soft however is on worker mobility, noting that blue collar miners can work their way up to earning the eight-figure salaries enjoyed by his squadron of commodities traders. Just try him. One thing is clear, Kitimat can now add Rio Tinto and Rio Tinto Alcan to the mix of uncertainty along with Shell, Chevron, Enbridge, Apache and the rest of the corporate movers. In other words, we are all extras in the corporate Game of Thrones. The US based Natural Resources Defence Counsel environmental group, a major opponent of both the Keystone XL and Northern Gateway pipeline projects, is praising Rio Tinto for divesting its interests in the controversial Alaska Pebble Mine project. 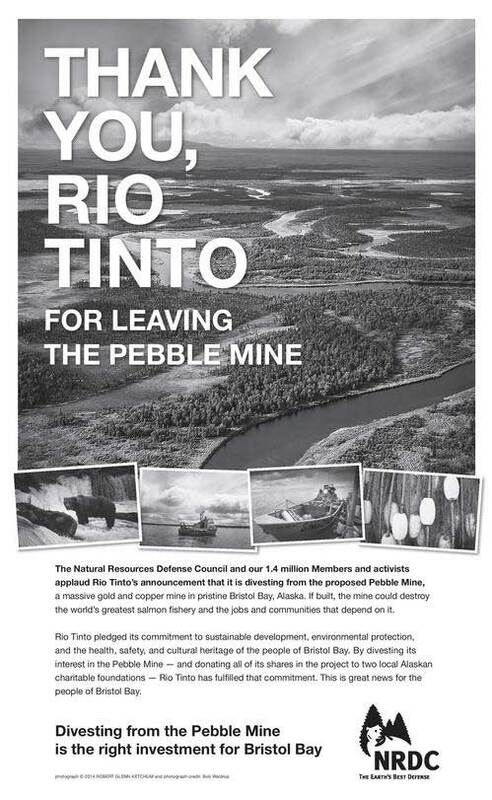 The NRDC is, in fact, so pleased, with Rio Tinto that they took out an expensive full page ad in London’s Financial Times to congratulate the mining and smelting giant which, of course, owns Rio Tinto Alcan and the aluminum smelter in Kitimat. The National Resources Defence Counsel is often a favourite target for the Harper government and oil-patch conservatives who see it as one of the foreign environmental groups interfering in Canadian affairs. We’ve gone each year [to corporate shareholder meetings or to meet corporate executives] to fight the Pebble Mine — a 21st Century example of what the mining industry will do if given free reign, based on promises of safety, sustainability, and technological innovation that can’t be kept and must not be believed…. In 2010, I also traveled to Tokyo to meet with leadership of Mitsubishi Corporation, a former significant Pebble shareholder that quietly sold all of its interest in the project eight months later. This has become an essential aspect of our advocacy with multi-national corporations: meeting privately with company leadership and participating in the once-a-year public gathering of their shareholders, of which – in order to gain access — we are one. Attending the shareholder meetings is no fun, requiring immersion in a world where natural resources are for extraction and exploitation, where representatives from far-flung communities seeking remediation and redress from contamination recount the tragic impacts of mining on their daily lives. But this year promised to be different for the residents of Bristol Bay – and for those of us supporting their cause. We were there to thank them for listening to the people of Bristol Bay who, by overwhelming numbers, have consistently voiced their opposition to the mine – a project that embodies the greatest threat ever posed to the economic lifeblood of the region, the Bristol Bay wild salmon fishery. Each of us in turn – including Bobby Andrew (Yupik elder and spokesperson for Nunamta Aulukestai, an association of Bristol Bay village corporations and tribes; Kim Williams, Executive Director of Nunamta Aulukestai; and Bonnie Gestring, Circuitrider for Earthworks) — delivered a simple message: that Rio Tinto had fulfilled its commitment to Bristol Bay’s communities to act responsibly in a manner consistent with protection of the wild salmon fishery and the wishes of the people who depend on it. Given the scope of the proposed Pebble Mine and the unavoidable risks of contamination associated with its location, there is only one responsible course – divestment – and that is precisely what Rio Tinto had done. The company deserved congratulations, and we conveyed it unequivocally. 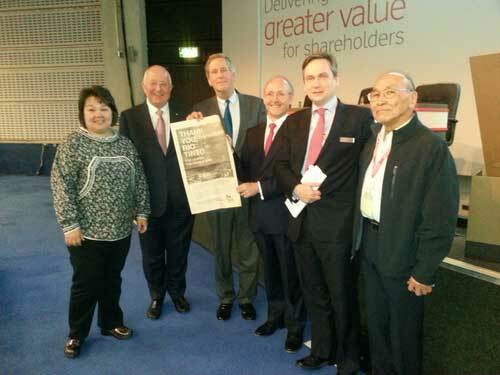 Later, meeting with Rio Tinto directors, Reynolds presented the board with a copy of the ad from the Financial Times. NRDC and its 1.4 million members and activists join the people from Bristol Bay, Alaska Natives, commercial fishermen, sportsmen, jewelers, chefs, restaurant and lodge owners, and conservationists in thanking Rio Tinto for showing environmental and financial leadership by divesting from Pebble Mine. The Haisla Nation and other groups often quoted NRDC studies on pipelines in their presentations before the Northern Gateway Joint Review Panel. The BBC, reporting from the Ocean Sciences Meeting in Salt Lake City, says Norwegian scientists are becoming concerned about dumping huge amounts of tailings in the country’s fjords. Reporter Jonathan Amos in Scrutiny for Norwegian fjord rock disposal says for decades some Norwegian mining companies have been using pipes at 23 sites to dump tailings as far down as 200 metres in Norway’s deep fjords. Companies are seeking permits to do more dumping. However, there have been no major scientific studies of the consequences of dumping tailings into the deep fjords. Now the Norwegian Institute for Ocean Research (Niva) is embarking on a three year study to look at the consequences of tailing dumping on the deep ocean bottom. All the animals that live in the sediments that provide food for larger invertebrates and fish, for example, will be killed off. Potentially, you are also going to kill off a lot of deep water corals. Amos also quotes Lisa Levin, from the Scripps Institution of Oceanography in La Jolla, California, as saying that the Norwegian tailings story was a classic example of an activity being undertaken without fully understanding its consequences. Last summer, members of the International League of Conservation Photographers visited the northwest of British Columbia in what they call a RAVE (Rapid Assessment Visual Expedition). One RAVE involved photographing areas which ILCP members feel may be threatened by the construction of the Enbridge Northern Gateway Pipeline and the increased number of supertankers plying the west coast of British Columbia. That RAVE shot mainly along the coast and in the Great Bear Rainforest. At the same time the ILCP conducted a second RAVE along the Skeena, Nass and Stikine Rivers. Today, National Geographic announced that a book on the Sacred Headwaters would be released in October. National Geographic says the Sacred Headwaters RAVE was launched with partner Skeena Watershed Conservation Coalition (SWCC) to produce images of the Sacred Headwaters of (the birthplace of 3 of British Columbia’s greatest salmon rivers – the Stikine, Skeena, and Nass). The text is written by author and National Geographic Explorer-in-Residence, Wade Davis. 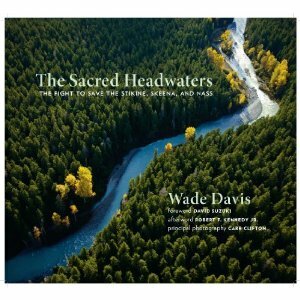 The book will be used as a tool by iLCP, SWCC, other local conservation groups and Wade Davis to derail proposed mining projects that would destroy the Sacred Headwaters. The book will be published in October 2011 right before the moratorium on mining in the Sacred Headwaters is lifted. Information on the ILCP Great Bear Rave can be found here. While the Great Bear RAVE did produce some stunning photographs, the photographers stayed along the coast and (at least for now) did not venture up Douglas Channel where the tankers will have to navigate the tricky waters to the port of Kitimat.